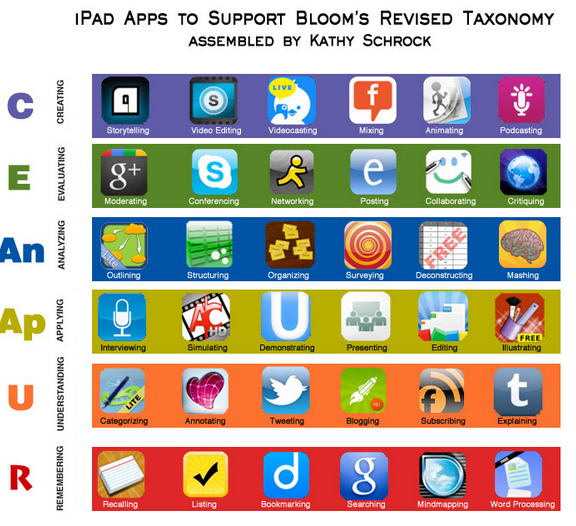 The graphic features some iPad apps that support different thinking skills of Bloom's Taxonomy. The apps are arranged in such a way to improve the thinking skill they pertain to. This is assembled by Kathy Schrok whose Guide for Everything is a resource we recommend for everyone of you . Below is only a snapshot of the graphic, to access the original one that is hyperlinked, click on this link. We also invite you to visit a list of iPad apps for Bloom's Taxonomy for more iPad apps on Bloom's Taxonomy.